The Mississippi River early in the morning. While in New York City last week I met a delightful couple from New Orleans. They were worried about their friends and family back home since Hurricane Isaac was approaching their wonderful city. A few years ago I had the privilege of visiting New Orleans, which if you haven’t gone folks, I highly recommend it. It’s a beautiful, vibrant, and friendly city. Fortunately Isaac’s damage wasn’t as bad as Katrina’s damage. This isn’t to say that it was a cakewalk either. My heart goes out to all those who were affected. 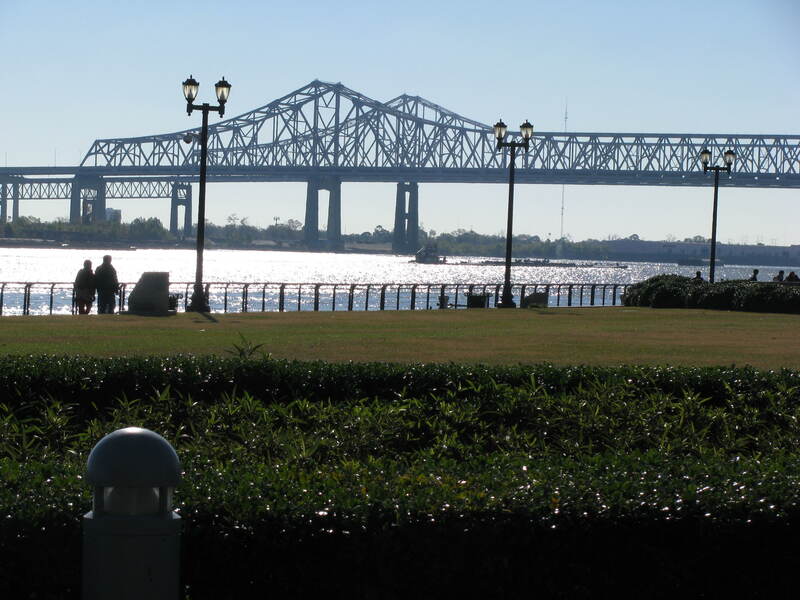 This entry was posted in Travel Photos and tagged 50 Year Project, Hurricane Isaac, Katrina, Life, Louisiana, Mississippi River, Natural Disasters, Nature, New Orleans, New York City, Photography, Storms, Travel, Travel Blog, Travel Journal, Travel Photo. Bookmark the permalink. Even a “small” storm can be bad news for a city with areas situated below sea level. I know what you mean…I know many are relieved that it wasn’t as bad, but it still hit many hard and not just in New Orleans. I think we all have victims of Isaac in mind. Glad it wasn’t as bad as feared. I hope the area and people can recover quickly. And my thoughts are with those who lost loved ones. I hope you do! And if you go, visit Anne Rice’s home in the garden district. In her novel, The Witching Hour, she used her home as the setting. Oh, that would be a must. I really enjoyed seeing her house. One of the reasons I visited New Orleans was due to her descriptions of the Garden District and all of the old houses. And the cemeteries are a real treat to see. I think you’d find much inspiration for your novels. So many wonderful writers resided there. That’s a great shot!! Well done!